Outdoor grill disposal. Talk about a boring subject. It’s not exactly exciting. And, it’s something you really don’t think about. That is, until it’s time to get it done. Only then, you find out it’s just not as simple as one would imagine. Like dealing with other nearly useless stuff, you’ll soon discover this isn’t something you can just put on the curb for the local trash collection to pick up and haul away. If you do put it on the curb, don’t count on it being hauled away by your local trash collection agency. The reason is simple — the components are largely considered to be hazardous materials, particularly the old gas tank. In other words, it’s not an item you can easily throw-away. Like electronic waste and other items, these contain hazardous materials. So, it’s a lot more work to offload an outdoor grill. Sell it. If it’s in working condition and still looks fairly good, you can try to sell it through an online ad or even at a garage sale. This might take some time but at least you’ll pocket a few dollars. Refurbish it. 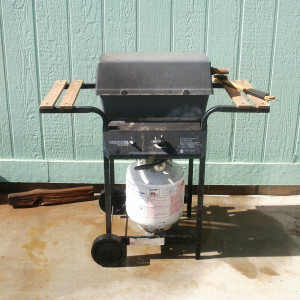 Before you dispose of an old outdoor grill, think about reviving it for continued use. You can disassemble it with a few common hand tools, then simply purchase replacement parts. You’ll need a new cooking grate, rock gate, igniter, and burner assembly. The whole process will take a few hours or about half a day from start to finish. Give it away. Instead of trying to sell it, consider just giving it away to a friend or a family member. The point is to offload it and not to try to make money on a sale. Recycle parts. Another option is to pull off the working parts with plenty of life left and reusing them again. If you need an old outdoor grill disposal or have other junk to throw out, just phone 800-433-1094 or visit Junk Garbage Removal.